One of the biggest turn-offs of portable air conditioners is the ugly plastic exhaust hose vent that no one wants to see trailing out an open window or door! People look for indoor cooling alternatives that are free of this particular accessory but are often disappointed to discover that there is currently no such thing as a truly ventless air conditioner that is completely portable! Don't be discouraged too quickly, however. There is a hose-free alternative that can keep you nice and cool with the added bonus that it costs a fraction of an AC to run and there is no exhaust vent! Often referred to as a swamp cooler, this type of room cooling device does not use a refrigerant process to cool the air that passes through its interior. Because there is no compressor or refrigerant gas, or for that matter any of the other mechanical processes that AC uses to chill the atmosphere, there is no hot air created and therefore no need for a venting hose like ACs need to allow the hot exhaust they create to be vented to the outside. In fact the only moving part inside a swamp cooler is the fan and that typically draws less than 200 watts of electricity to run. Compare that to the typical 2,000 watts a comparable AC needs to run and you can see straight away the obvious saving in energy consumption and of course the cost difference in running one. The clue is in the name, as these devices chill the atmosphere by simple (and economical) evaporation of moisture rather than using the expensive and energy hungry refrigeration processes that air conditioning employs. Just like your skin feels cold when you perspire and you experience a breeze, so these devices work by evaporating moisture internally and expelling the chilled breeze into the room. The now chilled, moist breeze is blasted out the front of the unit by the same fan. Most modern swamp coolers have control panels that allow you to vary the fan speed and the rate of air that is expelled from the unit, thereby controlling the temperature in the room. The breeze direction is generally controlled by swinging louvers that move from left to right as well as up or down. A handy timer is often incorporated to allow it to be used overnight and switch itself off after a set period of time, often up to eight hours. This is all controllable by remote for convenience in most models. While you may be pleasantly surprised at the low running cost of a device that is easily capable of reducing the temperature in a room by up to 25 degrees and matching the capability of the more expensive to run AC, there is one major flaw. When the natural humidity in the atmosphere is high (above around 50% generally), the effectiveness of evaporating coolers is reduced. This is because as the internal atmosphere becomes more saturated by moisture, the chilling effect of evaporation is reduced. If you live in a high humidity area, these models are not generally recommended as their ability to cool the room is not as effective as traditional AC. It's a shame that humidity forces you to spend more money to stay cool, but that's the trade-off that comes with living in certain climates. However, it's not all bad news. 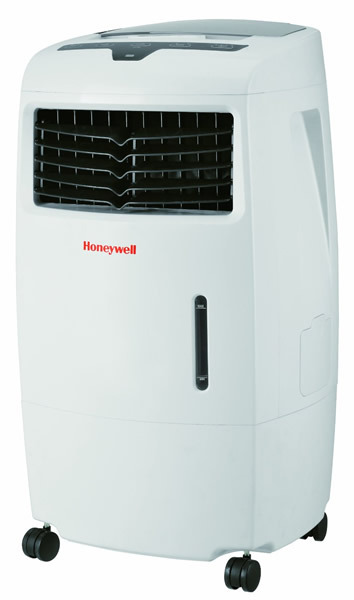 Swamp coolers will work in moderate humidity and there have been reports of users obtaining adequate cooling from them in humidity levels as high as 80% by placing the unit in front of an open door or window and allowing the outside air in to be cooled as it is cycled through the room. In fact, even in moderately humid climates, it is recommended to have an open window to allow the moist air to escape to the outside. This has many advantages over closed room operating of AC, most notably that the atmosphere is continually recycled and kept fresh. You can learn much more about this great cooling alternative from this authoritative resource that covers all aspects of air conditioners that are portable and ventless by following that link. We can recommend some of the top rated evaporating air cooling models that can be purchased online at very affordable prices below.